Capt. Ted Lund is the editor of Fly Fishing in Salt Waters, and is a contributing editor for Sport Fishing. Born and raised in Cocoa Beach, Florida, his family owned Banana River Tackle, and was also known as one of the premier manufacturers of custom cast nets in Florida. Lund started early, beginning to learn to fish at 2, and fly fishing in salt water at 8. At 16, he became outdoor news assistant for Bill Sargent at Florida Today Newspaper. Sargent instilled an interest in outdoor communication. Ted Lund, editor of Fly Fishing in Saltwaters magazine, has recently returned from an extraordinary expedition to Australia and the Coral Sea and will be sharing his experiences on planning the trip and fishing for the dogtooth tuna, bluefin trevally, the coral trout and many more exotic fish. Upon graduating from the University of Florida College of Journalism and communications, he left the field to become a light tackle fishing guide in Key West. Specializing in fly-fishing and world record hunting, he and his clients have set 31 IGFA records. An innovative fly tier, his patterns have accounted for more than 60 IGFA world records, including the first-ever hammerhead shark taken on regulation fly tackle. Lund is highly sought after as a consultant in the marine industry and has had affiliations with leading marine manufacturers including Suzuki Marine, Penn Reels, Yo-Zuri, Segaur and Maui Jim. He was on the founding masthead of both Salt Water Fly Fishing and Fly Fishing in Saltwaters. His writing and photography has appeared in numerous publications, including The Miami Herald, Salt Water Sportsman, Sport Fishing, Fly Fishing in Saltwaters, South Florida Sport Fishing and the IGFA annual yearbook. 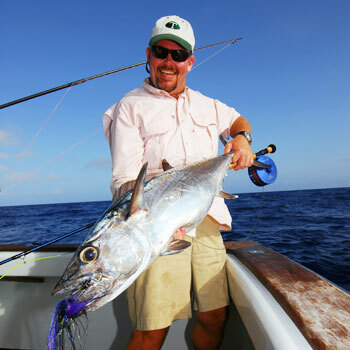 In 2003, Lund left the Florida Keys to become Managing Editor of Sport Fishing and two years later was promoted to editor of Fly Fishing in Saltwaters. For more information on his premier saltwater fly fishing magazine visit the Fly Fishing in Saltwaters website.